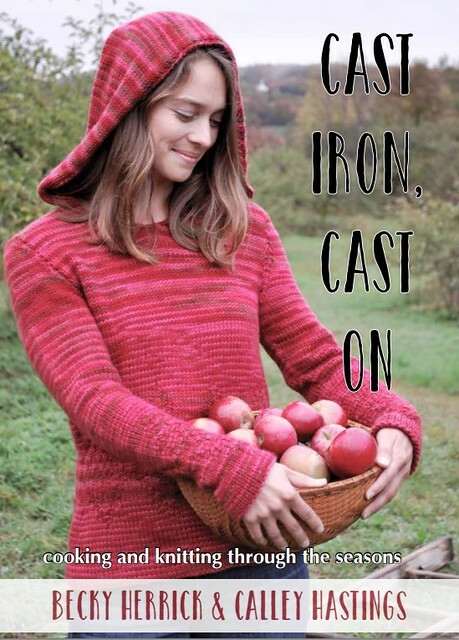 If you’re in the area Calley and I will be signing copies of Cast Iron, Cast On at Yarn (the knitting store in Montpelier) this saturday! 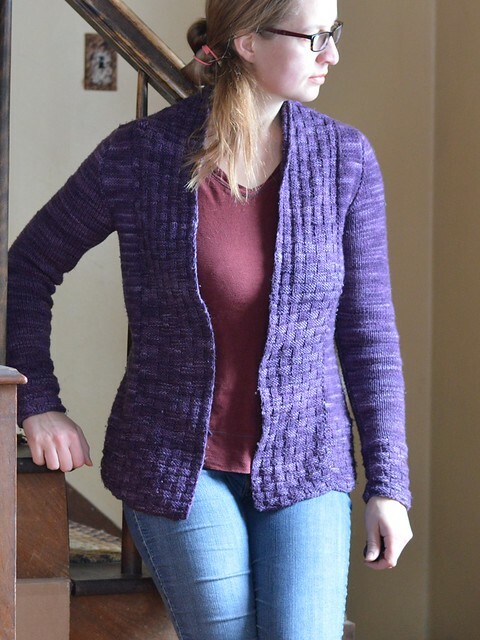 Stop by between 2-4pm to see all the sample garments, browse through the book in person, and even buy some yarn. I love this store, and they carry quite a few of the wonderful US spun and dyed yarns that I featured in my designs. We even have a facebook event, so you know it’s a real thing! I love this sweater so, so much. I’m giving it a post of its own! 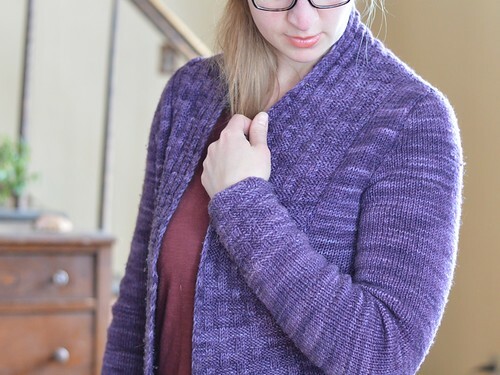 This is my blueberry sweater (on ravelry for more photos). 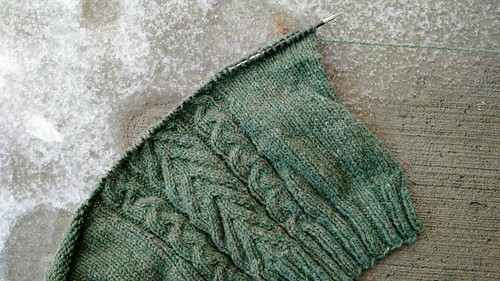 The pattern is Bluegold, the January sweater from Cast Iron, Cast On. This pattern was inspired by the coziness of winter and the pretty latticework on fancy blueberry pie*. 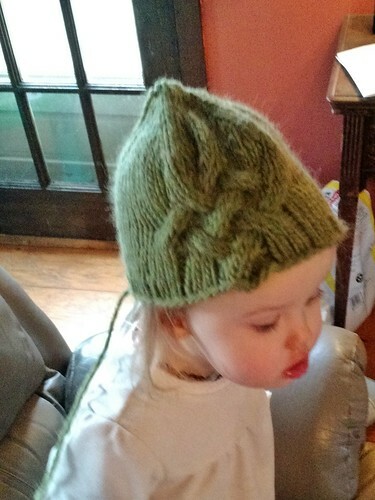 This is not the only book sample which I knit in my own size. But for some reason it’s totally my favorite. I’ve mentioned before that I’ve loved this book sample to pieces. I wore it almost constantly while pregnant. 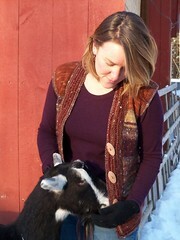 A cardigan is probably the best maternity sweater out there. The fabric has pilled a bit, but the superwash DK yarn from Periwinkle Sheep is brilliantly strong as well as holding those deep, saturated colors so perfectly. The biggest tragedy was the hole in the shoulder – pretty sure we have one of my cats to thank for that. Then I wrapped the yarn around that first strand – so that the working yarn is like a coiled spring that runs through the live stitches at the bottom and around the first rung. The next set of coils went around the second rung and through the tops of the first coils. 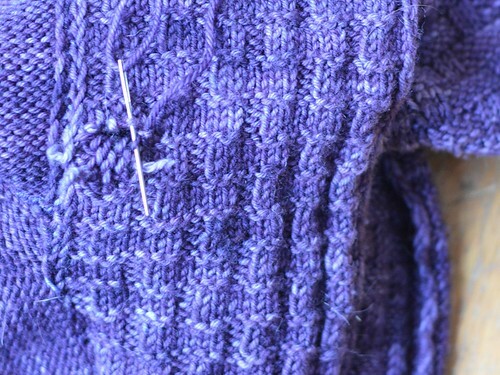 The final row goes through the live stitches at the top and the coils of the row below. It’s a patchwork job. But this coiled yarn maintains the stretchiness of the lattice work pattern in way that a traditional darning job wouldn’t. 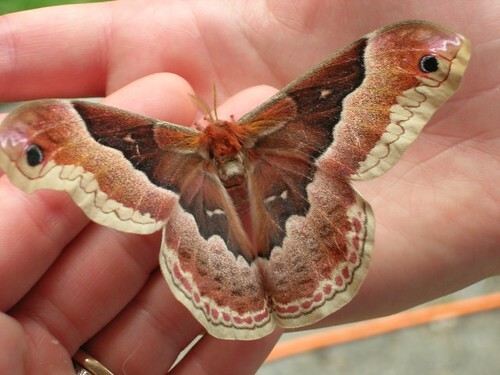 And (while being hard to describe) was easy to accomplish. And that patch job? It doesn’t look half bad either! *Note that the recipe in this chapter ended up being a blueberry jam cobbler – no lattice pastry required. Sometimes the recipes evolved beyond the inspiration of the pattern. That’s the organic nature of our book writing process. 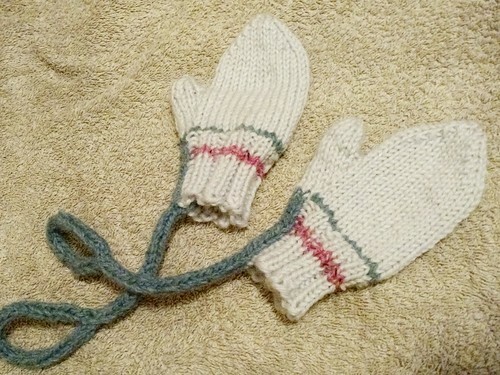 Here’s a quick little project: more toddler mittens! If you spend a little time in the knitting-mommy groups on ravelry you’ll start to hear stories about daycares (ok, probably true about any circle of people containing more than two moms). I’d heard that some daycares :::gasp::: don’t like wool mittens because they get WET. 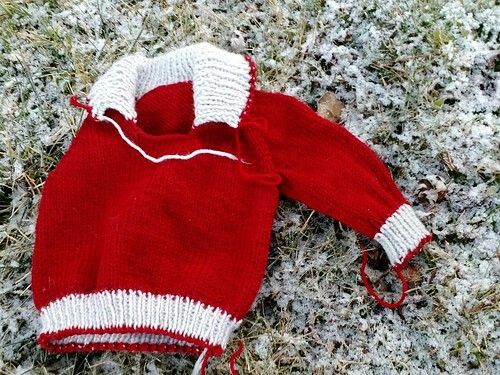 Nevermind that wool keeps you warm when wet, unlike synthetic mittens. But, as in many other ways*, Windsor’s daycare is amazing. They have not worried once about her mittens, honestly they told me that all the toddlers mittens get wet every time they go out. I mean, this age group spends most of their time scooping up snow and shoving it in their mouths. Of course their hand-coverings get wet. So when the monthly newsletter asked that all kids have two pairs of mittens (in case they go outside twice in a single day) I knew I needed to whip something up. These used scrap yarn and no particular pattern. She’s getting so good at putting her own mittens on that I wasn’t even begrudging about having to knit teeny-tiny thumbs. *they didn’t bat an eyelash when I sent her in as a baby in cloth diapers with woolen covers. That was a sign about how chill they are. The other way they are amazing is that they take the kids outside at least once any and every day that the temperature/windchill is over 10F. I can’t imagine getting EIGHT two year olds dressed in all that gear on a daily basis. The point of this soup is twofold: a warming dish for a sleety January night and to use up leftovers. So keep it simple, don’t rush out to buy extra spices, just substitute in whatever you have. Broth can be anything. Salty water would do in a pinch. You could use veggie broth if you prefer. I’m not gonna lie, I used that “better than bullion” base. My spices* are either fancy or lazy, depending on your point of view. The French four is just white pepper, nutmeg, ginger, and clove. 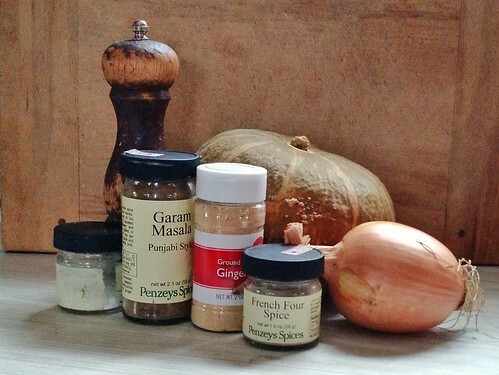 The garam masala is corriander, black pepper, cardamom, cinnamon, kalonji, caraway, cloves, ginger, and nutmeg. Are you detecting a theme? This squash soup is warm and savory with ginger and just hints of the sweeter spices. If you’re working from a more standard collection of spices I’d use mainly pepper and ginger, add in a decent amount of nutmeg, a good shake or three of cinnamon, and just a pinch of whatever else from that list you’ve got on hand. Oh and the garlic. Don’t forget about it. Roast the squash, or use leftovers. Pour a couple of tablespoons of oil into your soup pot. Saute the onion over low heat (chop it first) until translucent and just beginning to brown at the edges. Puree. I use an immersion blender. Add salt & pepper to taste. Serve with bread and butter, if you’re feeling classic. We made muffins, not too sweet and with no fruit, to have on the side. This was our dinner the night before last. I’m so excited that Windsor is good enough with a spoon to enjoy pureed soups. *All my spices come from Penzeys these days. Although we’re still refilling old containers for a couple that we have just always bought in their bulk bags. I find the quality is amazing and the prices are so much better than at the grocery store. And I have no affiliation or reason to promote them here other than how delicious they are. I’ve picked up a long term work in progress. 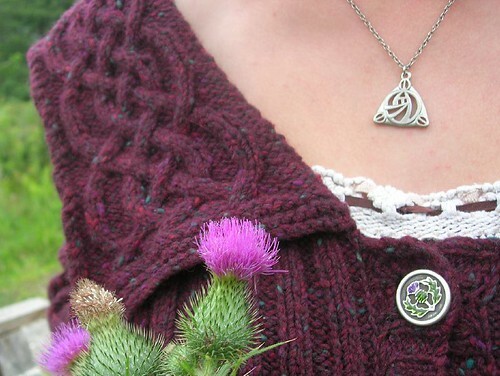 This is my Roam tunic, which I cast on back in 2012, and it’s been hibernating for THREE YEARS. 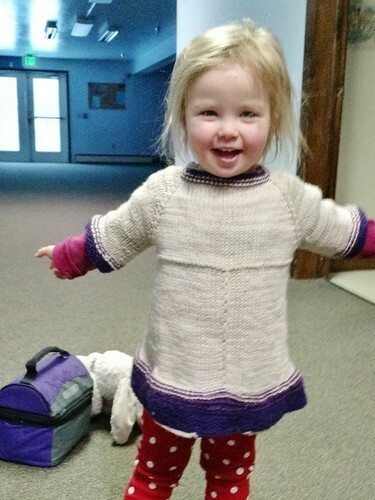 When I started this, I didn’t want a sweater dress – so I made it shorter. I planned to make it either a vest or maybe a long sleeve sweater. I changed the gauge and took the pocket off. 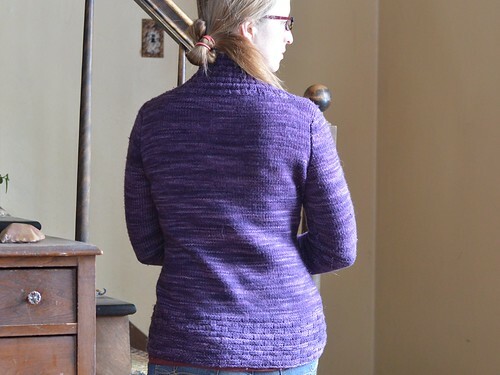 I knit the whole back, and the front up to the waist. Then I ran out of steam. But that’s actually a lot of knitting already done! I finished the front within the first five days of picking the project back up. I had a slight hiccup: I started the arms an inch and a half too early and had to frog it all back. But I still haven’t slowed down. The cowl is half done, I’m making it longer and using garter rib for the second half to make it more cowl-y and less turtleneck-y. The only other mod? Well, I’ve decided I need another sweater dress. So I took scissors to my knitting. I snipped a strand just above the ribbing, unraveled a row, and put the live stitches onto a holder. 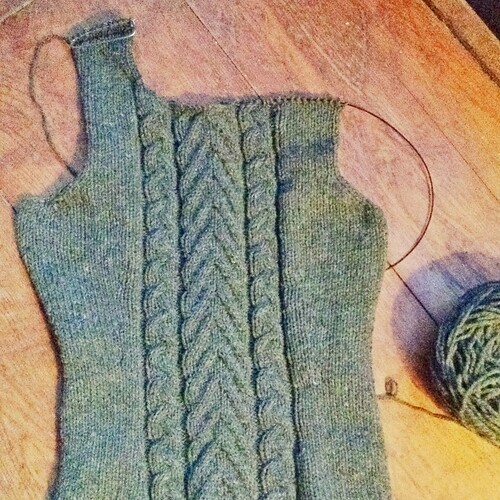 Once I finish the cowl and sleeves I’m going to knit enough ribbing to make this vest back into a dress again. Does it count as indecision if I change my mind over the course of 3 years? I never did a GAL wrap up after the holidays, mostly because I had a serious case of camnesia and forgot to take pictures of a lot of things. But let’s see what I can scrounge up. I also knit Windsor a Puddle Duck sweater. Which she loves. Actually, she loves anything with pockets. The only thing better than pockets are pockets AND a hood. 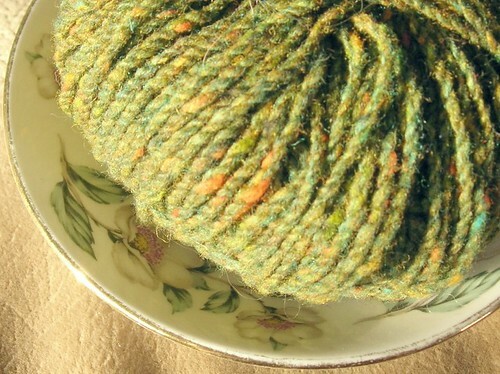 And now that January is upon us I’ve fully embraced selfish knitting month. 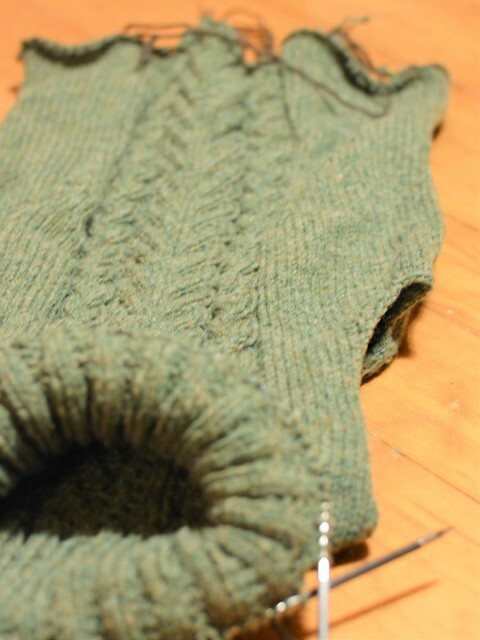 I dug a half-finished sweater dress out of deep hibernation and I can’t wait to finish it up. I’ve got three sweater dresses in rotation right now but I want more. More! Good thing this WIP is 3.75sts per inch. 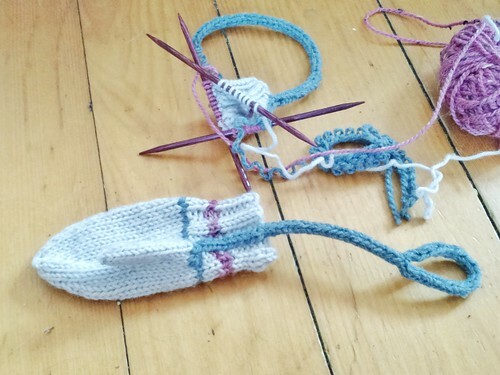 It’s knitting up FAST. Stay tuned!